More recognition from the conference’s the 2015 “Eye on Biodiesel” awards. Sen. Al Franken from Minnesota was honored with the Impact award for his work as a long-time champion for biodiesel in Washington, taking a particular leadership role last year in challenging the EPA’s initial proposal that would have weakened Renewable Fuel Standard (RFS) volumes. Sen. Franken has helped organize his Senate colleagues in holding meetings on the issue with senior Administration leaders. He has coordinated advocacy letters from members of Congress. And he has spoken out publicly to highlight biodiesel’s benefits in Minnesota and across the country as he fought for a strong RFS. Additionally, Sen. Franken has been a consistent and vocal advocate for the biodiesel tax incentive. His advocacy and leadership have been instrumental in helping to develop a policy environment in which biodiesel can continue to grow. 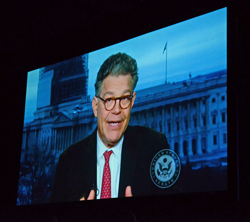 In recorded remarks played for the crowd gathered at the conference, Franken thanked the group for the honor and reiterated his opposition to the Obama Administration’s proposal to cut biodiesel requirement under the RFS to 1.3 billion gallons annually. Franken vows to keep fighting for the biodiesel industry, also working to reinstate the federal biodiesel tax credit.